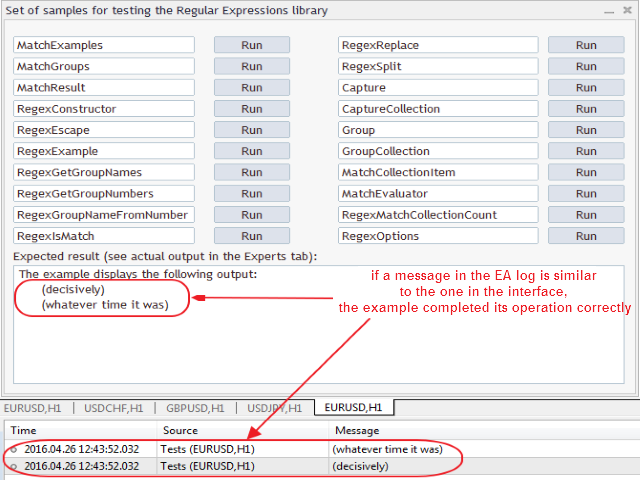 RegularExpressionsExamples — is an expert, which contains the graphical interface for running examples from the "RegularExpressions in MQL5" library. The codes of these examples can be found in the library itself. These examples are for demonstration purposes only. They serve only to evaluate the library operation and its capabilities. They can also be found on the official Microsoft‎ website, in the descriptions of classes in the System.Text.RegularExpressions namespace. Each example can be started by clicking the "Run" button, located to the right of the example's name. If the messages output in the application window and Experts log are the same, the code has been executed successfully. All made easy, thanks mql5.